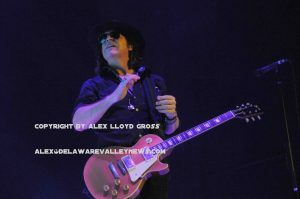 Alex Lloyd Gross Photo- Delaware Valley News.com Tom Gimbel live in New Jersey. Tom Gimbel, the musician that plays horns and rhythm guitar for Foreigner talked with us about the upcoming reunion show in Atlantic City, November 30, 2018. at the Hard Rock Casino. It’s a reunion show with Lou Gramm, Ian McDonald among the founding members of the band to take the stage and play. “We come out with the current band, then the original Foreigner reunited on stage, and they do a set. Then we’ll do a few songs with both bands together on stage, Gimbel said. Currently, Gimbel is in California and will fly in later this week to insure he is on time and not stuck at the airport. He’s looking forward to seeing Atlantic City and depending on the weather he would love to take a stroll on the boardwalk. “I’ll be in a hat, coat and a scarf, I’d like to see some of the things out there, maybe grab some salt water taffy. During the show, you can expect Kelly Hansen to run around the arena, “He will sing to people, he will drink your beer, he will go nuts, he’s out of control on stage,” Gimbel said. As he is walking the boardwalk should you run into him, he will see where the beach concerts are held. It’s not too far from the Hard Rock and those concerts are held in the summer. Some are actually sponsored or put on by the Hard Rock . “Oh, that would be great to come back and do one of those, or a large stadium tour with a few classic acts,” While you are walking the boards, if you see Tom or other band members out for a stroll, feel free to say hello, “I love it, when that happens” Gimbel said. The Hard Rock Casino just opened in June of this year. It’s on the site of the old Taj Mahal.